We went for a walk around the neighbourhood the other day, getting to know the local area, and Dean and I immediately headed to the water’s edge of St Georges Basin. The view was quite spectacular. This is the view of St Georges Basin looking south from Basin View. This is the full image used above and is uncropped. I was surprised at how large the basin is – it’s huge with more than an estimated surface area of 40.9 square kilometres (15.8 sq miles), it is slightly larger than Sydney’s Botany Bay. 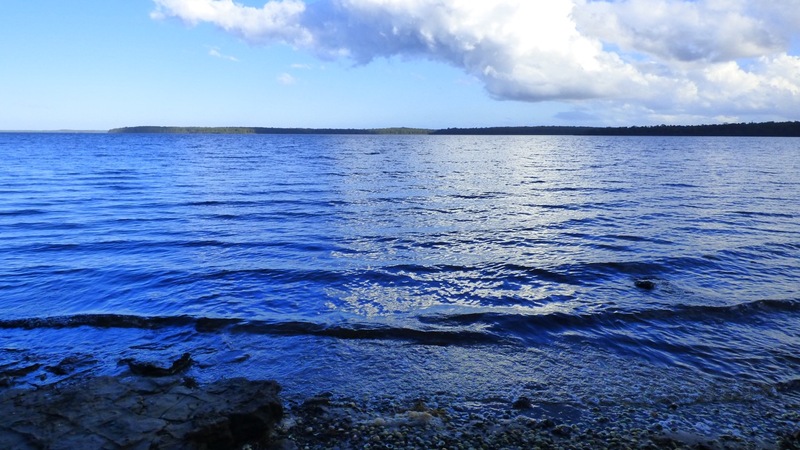 But – always a but – because St Georges Basin has an average depth of only 5.3 metres (17 feet), the water being held is half that of Botany Bay. The basin is fed by two creeks, Wandandian and Tomerong, and its primary outflow is into the Tasman Sea via Sussex Inlet making St Georges Basin a large but shallow inland sea or estuary. Apparently the fishing is good and I’m sure Dean will put that to the test soon enough. Facts and figures obtained from the New South Wales Office of Environment and Heritage website. Click here to see the facts on St Georges Basin. Click here to see the facts on Botany Bay. That water is so blue. Like I said on one other post. I’m always amazed at how different blues I see in your pictures. How far is this from the house you’re staying in? It really is a lovely blue Calen, and ony a two minute walk away.